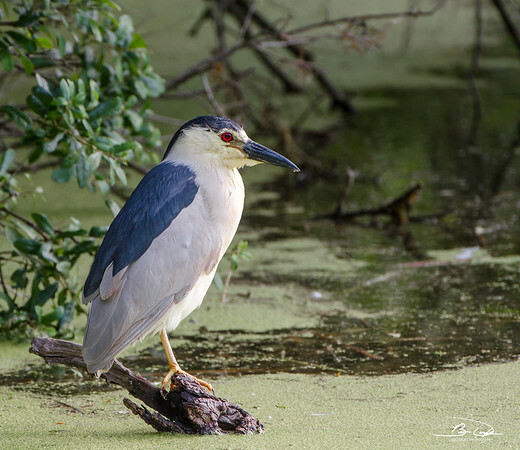 The Black-Crowned Night-Heron is not a new bird on the list. It made its Intrigued debut back in July 2015 (link here). We were out in Denver enjoying their very impressive botanical gardens when we stumbled on this species for the first time. I remember asking several people milling about including the groundskeeper what this cool calm and collected critter was. None of them had a clue. Had to grab a seat and start surfing with the phone to figure out what it was. I did go back and update the groundskeeper on the new information of which he was greatly appreciative. What’s the enjoyment in birding if you can’t share the experience? 4 years later and now I can’t believe it took that long to find one. Seems like they are everywhere now. 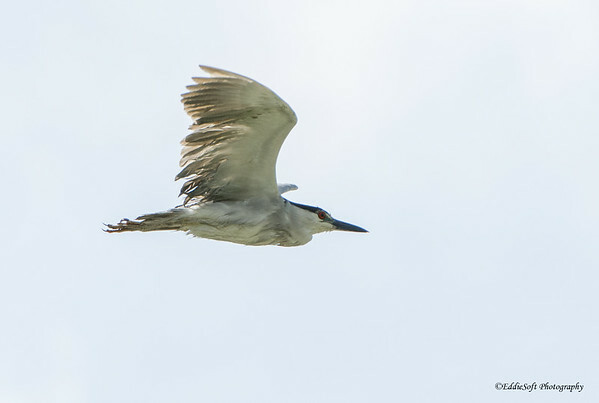 There were trees full of them when we found the Whooping Cranes in Texas (link here). Emiquon is loaded with them hunting for unsuspecting amphibious prey in the marsh and now it appears they also enjoy the Georgia swamps. 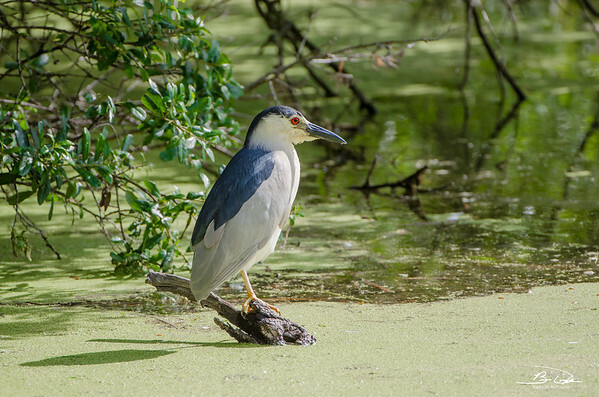 It always surprises me when I see birds calmly hanging out in waters that are teeming with Gators. Maybe they have some sixth sense or ninja skills that give them a sense of safety.. or a brain the size of an acorn ha! Take for instance this specimen. This was in the same area we were taking the Stork pictures (link here) and just down the levee from where the Gator decided to introduce himself (or herself) to us. Would think a tasty bird just sitting watch on the water would be a hell of a lot easier dinner choice. To its credit, it just sat there hunting the green waters for something to come within reach. It managed a quick glance over at us giving us a good look at that 3am Las Vegas eye and then went back to statue mode. Decided to title this post after a couple of quick shots taken as one went flying over our heads. 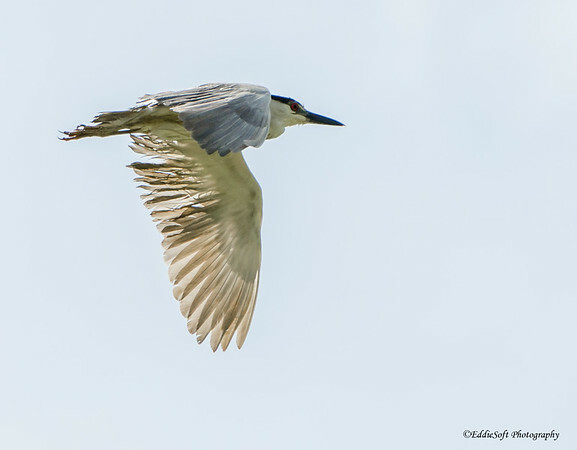 Even though Night-Herons tend to hang out in the dirty marshes, they keep themselves fairly proper. If you look at the reference shots on Cornell’s site or even do some quick DuckDuckGo searches you will likely see a nice collection of birds ready for black tie cocktail parties. This was why the raggedness of this one surprised me. Looks like it was ridden hard and put away wet. Tells you something about their power of flight even with wet and disheveled wings – hell, even the tail and body look like they lost a battle with a firehouse. Better get to some quick facts about the Black-Crowned. They definitely cover almost all of the continental US and down into Central America for some winter R&R. The reference books noted they do most of their hunting after dusk although it was around noon when these shots were taken (photographers probably already took note of the shadows). They are very social birds from a nesting perspective, yet territorial when it comes to their hunting grounds. They are late to the game when it comes to flight abilities. 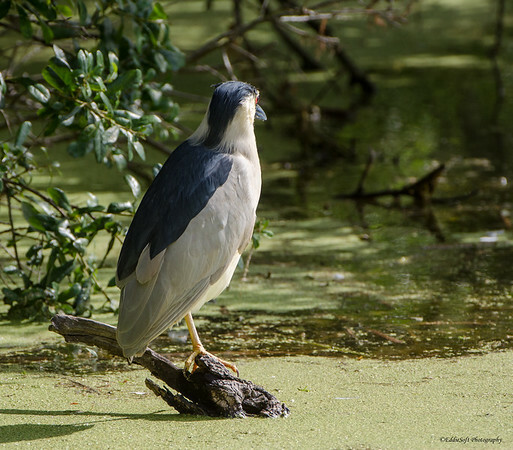 They will exit the nest in about a month requiring them to navigate (and hide) amount the available vegetation until their able to fly a couple of weeks later – talk about Gator-bait. Did I mention they have a set of blood red eyes? Maybe that is how they keep the Gators at bay – flash those bloody eyes, point to that stout dagger of a bill and utter “You talkin’ to me? Well I’m the only one here” (not that De Nero is worth quoting anymore). Time to wrap it up – one last angle shot for Ron. Looking forward to April everyone. Some interesting birds are just about ready to go and race season starts in 2 weeks with a half marathon trail run. Legs don’t fail me now. Nice shots, particularly the first two! I remember when you showed me the first one of these when I came down to Emiquon. They are really unusual birds. They look a little chunky when standing, much like penguins, but they are fast in flight. As you say, they tend to stand like statues. Maybe the flying bird with the awful wings had a mite problem. It’s interesting to speculate on what birds you have planned for April now, given that you had to create an extra post in March to free up space for them. I’m thinking NOT Cowbirds or Blue Jays or American Coots, knowing how much you dislike them. I think you like the colorful birds best, except for owls. Thanks again for the pics and info! There are few certainties in life beyond being absolutely exhausted after a long trail run and the slim chance in hell I’ll be featuring a Cowbird, Blue Jay or those damn water chickens – not gonna do it. I do have a couple of interesting ones I think everyone will like – that is if people like pretty birds (at least from perspective). In fact one even met Linda’s standard for taking a picture of and she has REALLY high standards. I do remember you getting your Night-Heron there.